We start by recalling the main theorem of this seminar (Weil II for curves) and illustrating some of its arithmetic consequences. Then we introduce the theory of Lefschetz pencils and deduce the last part (Riemann hypothesis) of the Weil conjectures. Finally, we prove the geometric semisimplicity of lisse pure sheaves, and use it to deduce the hard Lefschetz theorem. This is an expanded note prepared for a STAGE talk, Spring 2014. Our main references are ,  and . Recall that we have proved the following target theorem. is -pure of weight . is -mixed of weight . Via a series of elementary reductions, reduce to the case (at the cost of making the sheaf more complicated) and is lisse geometrically irreducible pure of weight 0. Fix , put in a 2-variable family over by Artin-Schreier twists. It suffcies to show that that is pure of weight 1 (the purity theorem) for and take the limit (weight dropping). Now fix and . To show the purity theorem, put in a 2-variable family over encoding at each fiber. is lisse and has geometric monodromy either a finite irreducible subgroup of or a finite index subgroup containing (the monodromy theorem). The monodromy theorem reduces to the computation of the 4th moment of , which in turn results from the computation . Choosing a space filling curve in , the big monodromy forces to be pure of weight 2 (Frobenius acts on the geometric coinvariants via roots of unity) and so the -series is analytic in . Now Rankin's trick implies that dominates each term , hence the latter is also holomorphic in . The tensor power trick then shows that is pure of weight 1, i.e., the purity theorem is true. Corollary 1 Let be a smooth compactification over . Then is -pure of weight for . : By Leray or Gysin, we have , which consists of the -invariants, is -pure of weight . (Note: cohomology groups are always understood as taking the cohomology of the base change ). : By Leray or Gysin, we have . Since is -mixed of weight , and by Poincare duality, is -mixed of weight , it follows is -pure of weight . Remark 2 Deligne's Weil II proved a stronger version of Theorem 1: replace by any morphism between any separated -schemes of finite type and by any -mixed constructible -sheaf of weight . Then the constructible -sheaf on is -mixed of weight for any . The weaker Theorem 1 is nevertheless strong enough to deduce the last part (the Riemann hypothesis) of the Weil conjectures. Several remarkable arithmetic consequences follows. 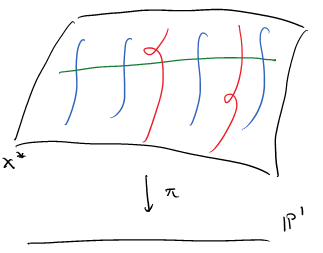 Theorem 2 (Riemann Hypothesis over finite fields) Let be a smooth projective geometrically connected variety. Then for any and any , is -pure of weight . Example 2 (Ramanujan conjecture) The Ramanujan -function is defined to be the coefficients of the -expansion of the weight 12 cusp eigenform Ramanujan famously observed (!) without proof that . This turns out to be a general phenomenon for coefficients of a cusp eigenform of weight and level , as a consequence of Weil II together with the algebro-geometric incarnation of cusp eigenforms. Let be the modular curves over with the universal family of elliptic curves . By the Eichler-Shimura relation, the Hecke eigenvalue ( ) of matches up with the trace of on the (2-dimensional) -isotypic component of Since is lisse on of pure of weight 1, by Corollary 1, the above is pure of weight . Therefore both eigenvalues have absolute values and so . Notice in this example, it is convenient to work with non-constant coefficient systems. Here is another typical example. Example 3 (Kloosterman sum) Let . The classical Kloosterman sum is defined to be This can be interpreted geometrically as follows. Let be the Artin-Schrier sheaf on associated to the additive character Let be the smooth affine variety of dimension defined by the equation and define Then Deligne computed that Hence by the strong version of Weil II, we obtain the estimate , which is certainly not easy to obtain using elementary methods. When is a curve, the Riemann hypothesis follows from Corollary 1, since is -pure of weight 0 for any . For the general case, we induct on via the theory of Lefschetz pencils. The hyperplane section is smooth for all in an open dense subset . 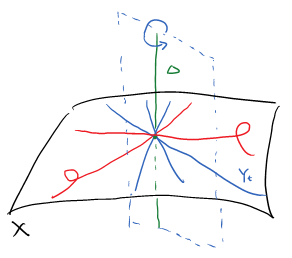 For , has only one singular point and the singularity is an ordinary double point, i.e., its complete local ring of is the form , where is a non-degenerate quadratic form. The axis of the pencil (of codimension 2 in ) intersects with transversely (so has dimension ). Using incidence correspondences and the Bertini theorem, one can show the existence of Lefschetz pencils. Theorem 3 There exists a Lefschetz pencil of hyperplanes defined over on , after possibly a finite extension of the base field and possibly replacing the projective embedding from by for some . Let be the blow up of along , then we obtain a projective morphism with smooth fibers over , where is a finite set of points. After possibly a finite base extension, we may assume consists of -rational points. The Leray spectral sequence for the blow up implies that So it suffices to prove the purity statement for . Due to the simple nature of singularities, it is possible to describe both the local and global monodromy actions on the cohomology. In the complex setting, this is classically known as the Picard-Lefschetz theory. In the -adic setting, this is done in SGA 7 and is briefly summarized as follows. For , and acts on trivially. Namely, away from the middle degree, the singularity at is not seen. (the invariants under the global geometric monodromy). Now we can finish the induction step. For simplicity let us assume is odd (the even case is similar). Let and . Then by the property of the Lefschetz pencil (Theorem 3 a), b)), we have . The Leray spectral sequence implies that By induction and proper base change, is lisse on , pure of weight . So Corollary 1 implies that each term is pure of weight . Hence is pure of weight as well. This completes the proof of Theorem 2. Theorem 5 (Geometric semisimplicity) Let be a finite field and be a prime number. Let be a smooth geometrically connected variety. Let be a lisse -pure -sheaf on . Then the representation of associated to is semisimple. Next we will see how the geometric semisimplicity grew out of the arithmetic consideration of weights can help us to understand the fundamental geometric structure of smooth projective varieties. Theorem 6 (Hard Lefschetz) Let be a projective smooth connected variety over an algebraically closed field (of any characteristic). Let be an ample line bundle on and . Then for any , the -th iterated cup product is an isomorphism. Proof Since and are defined over a finitely generated subfield of , using the defining equations, we obtain a morphism of scheme and an ample line bundle on with the generic fiber and , where is scheme of a finite type over . After possibly shrinking , we may assume has projective smooth connected fibers. To show is an isomorphism on over generic point, it suffices to check it is an isomorphism on each closed point. This puts us in the situation where is the algebraic closure of a finite field (even if we work with at the beginning). We mention one immediate geometric consequence of the hard Lefschetz theorem to end this talk. Corollary 2 The -th Betti number is even for odd . N. Katz, L-functions and monodromy: four lectures on Weil II, 2000, http://web.math.princeton.edu/~nmk/arizona34.pdf. Milne, James S., Lectures on Etale Cohomology (v2.10), Available at www.jmilne.org/math/. Deligne, Pierre, La conjecture de Weil. II, Inst. Hautes &EACUTE;tudes Sci. Publ. Math. (1980), no.52, 137--252.